The SharePoint Organizer is a complete tool to manage SharePoint database content (Sites, documents, library, lists etc). This program allows you to convert or map mailboxes & all items in it with other Cloud based storage services like; SharePoint, Office 365, etc. This tool can be used as a standalone utility to perform multiple operations related to migration. This option helps you to perform migration between two SharePoint databases. If you want to map or migrate content/sites of one SharePoint database to another, you need to provide credentials for both. Also, the software will list all the mailboxes of both databases for preview (source & destination) on a single screen. You can migrate the content of a SharePoint database into MS Office 365 mailboxes with this option. Map all the mailboxes and switch the environment from the SharePoint 2016/2013/2010/2007/2003 to MS Office 365 SPO. Here, you need to provide SharePoint credentials in Source end and Office 365 login details in destination end. If you are having an existing Office 365 account and want to switch to SharePoint then this option is suitable for you. Provide the required Office 365 login credentials at source end and SharePoint credentials at the destination end. Software will list all the mailboxes and allow user mapping to export the data from source to destination. SharePoint Organizer also allows you to perform the migration of Office 365 SharePoint Online to SharePoint Online. Check the option for Office 365 in both; source and destination end to migrate sites from Office 365 to Office 365 SPO. You need to provide the login details of both Office 365 accounts. Once you are logged in, software will show an entire list of all the items in Office 365 account. The software allows you an easy means to export mailboxes from one server database sites to that of another. Once you log into the accounts, software will list all the mailboxes found within your database. Next, you can drag and drop single mailboxes from source to desired folder location in destination. After that start the migration process and software will move all mailbox items from source to destination. For the successful migration of permissions and other items like; Task, contacts, etc. ; from source SharePoint to destination, user must create a .csv file containing mapping details of Source and destination user mailboxes. With the help of this user mapping option; it is possible to create User Mapping .csv file; which comes in use during migration. Before stating the migration process, you will be prompted to choose desired migration options which include: Migrate dates, Migrate permissions, Overwrite folders, overwrite files and versions to be migrated (Latest or All). Each of them is optional and can be enabled or disabled as per your choice. As the migration starts, SharePoint Organizer will show you the real time migration report. You can view the conversion status in three different tabs. First tab will list mailboxes that are pending for migration, second tab will show you the pending mailboxes, and completely migrated mailboxes are listed in the third tab. Free/Demo of SharePoint Organiser software transfers/moves only 50 site items while SharePoint to SharePoint migration. Do I need to have live environment to make these conversions? Yes, Live SharePoint as well as Office 365 account is required for each of these migrations. I want to migrate SharePoint 2010 to Office 365. Can I do this using your tool? Is this version of SP supported? Yes, using SysTools SharePoint to Office 365 migration tool you can easily migrate SP verions 2016/2013/2010/2007/2003 to SharePoint Online. I need to migrate SharePoint 2013 to 2016. I want to know what all data will be migrated? You can migrate complete SharePoint database from one server to another. The versions supported are O365 SharePoint Online, SP 2016/2013/2010/2007/2003. I wanted to migrate my official account data from Office 365 to SharePoint that I personally use for some additional work purpose. Mailbox migration seemed to be a difficult option in my case but SharePoint Organizer made it so easy that I love the tool already. With the highly impressive On-Site SharePoint to O365 database migration options and performance, this tool also has one more thing that I love. The operational interface is absolutely easy to understand and the navigations have been made clearly understandable. Developer's work is highly appreciable. I love the way this tool helped me to migrate SharePoint site from one server to another. One of the best utility to transfer/move complete sites collection from On-Premises SharePoint to cloud and vice versa. We were looking for the best solution to perform O365 SharePoint Online to SharePoint Online migration but we failed many times. 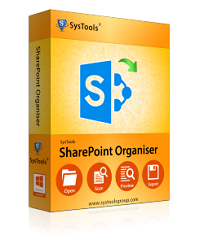 Then we came across SysTools SharePoint Organiser and it helped us to move complete SPO sites to another database. Kudos to the team!